I don’t have a panini maker. While I’ve thought a time or two about how it would be nice to have one, I’ve never been able to justify buying one for “every now and then”…especially when I’ve got a perfectly functioning grill and a brick covered with foil. 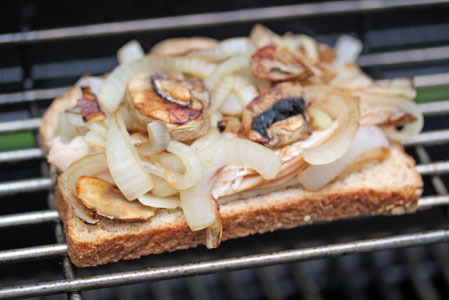 Once the mushrooms and onions are done, prepare the sandwich…spread dijon or spicy mustard onto both slices. 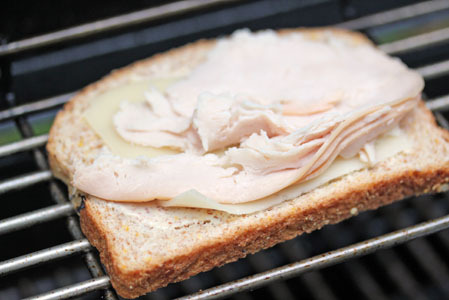 Place 1 slice plus 1/2 slice Swiss cheese and turkey deli meat on the bread. 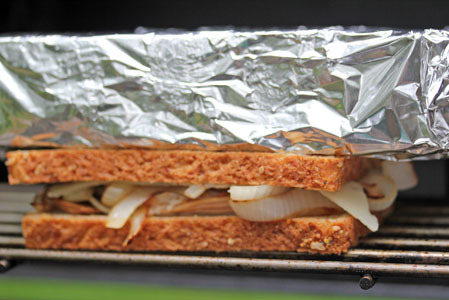 Place brick or other heavy object on top to smush the panini together. Grill for 3-5 minutes per side, depending on how hot your grill is…watch the underneaths of the edges of the bread as best you can so that it doesn’t burn. Slice and serve! The perfect summertime sandwich! 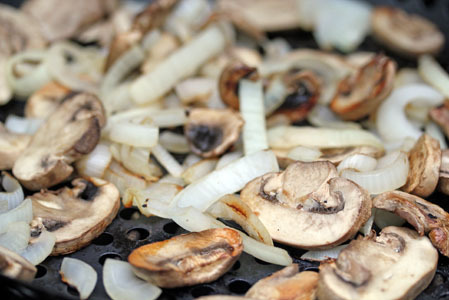 Grill the sliced onions and sliced mushrooms in a grill basket or skillet, 5-10 minutes, or until begin to brown. Toss or stir a few times. Place on the grill over indirect heat and press down with brick or other heavy object. Grill for 4-5 minutes per side. Wow, sounds delicious! Sandwiches are such an easy, practical, meal. What other kind of cheese do you think would taste good with this sandwich? We don’t usually have swiss around ;-(. Provolone would be my next choice Steph! I would change a couple of things to make it healthier. Don’t use deli meat (lunch meat) it’s packed with salt and preservatives. Use left over chicken or turkey that you cooked yourself for another meal. Use whole grain bread. I don’t like onions, so I would add avacados or pears as a substitute. Sounds like something I’m surely willing to try out. Thoughts for someone who is a little unsure about using a large grill? I don’t wish to use ours as it is quite large so I am a bit intimidated. 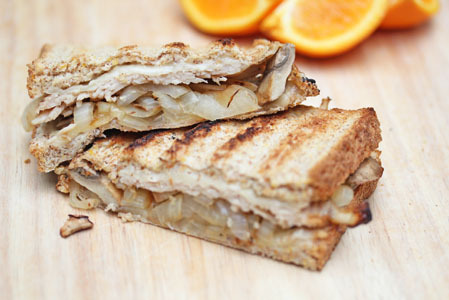 I love swiss cheese and onions, this sandwich is a keeper to me! Even when it is hot out I still prefer a warm sandwich over a cold one.